While researching field trip ideas and trolling for science fair resources, I happened upon the mock apple pie via the Exploratorium Science of Cooking. 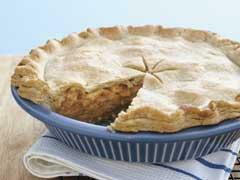 Kraft also lists the recipe, and the mock apple pie is tested against real apple pies in this experiment. Intriguing. Has anyone tried it?